I don't play red,blue or yellow anymore since I have firered.I also lost my Game Boy Colour. I still sometimes get out my Yellow for nostalgia. I think I got it from a friend's dad who was on a trip to America. It was my second Pokemon game after Gold, and I played it to bits on my trip to Scotland. Last edited by goldenquagsire on Thu Jun 01, 2006 12:45 am, edited 1 time in total. Well, I would still play Yellow (my first PkMn game) if it hadn't already been sucked into that black hole attatched to my house. What was it called again...? Oh yeah, my garage! I haven't seen my poor Yellow version in over four years (sobs). However, my buddy is going to give me his, so I expect that I'll be playing it alot. It always was (and still is) my second favorite version next to Crystal. My first was Blue , and I don't play it anymore. 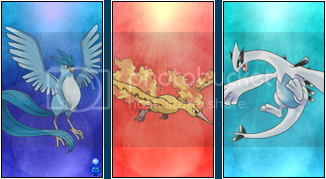 Mostly becuase none of the pokemon are tradable to any other generation of game. Er... Gold/Silver/Crystal ring's a bell? I play it now and then because it's nice to have some retro action in your life. Red was the first game I bought because it was my favourite colour at the time. But when I found out that different pokemon were in different games, I snatched up Blue faster than you can say Game Boy. It's fun every once in a while to raise an awesome team, then trade that team up to my gold version and have fun with that team. I got yellow first. I don't really have the time to play it. I only play Yellow when it is holidays or when I got bored of playing my Ruby(My favourite) , Sapphire, LeafGreen and Emerald. I play Gold alot, but a good portion of my time is in LF. Man I hate Moltres, I get its health down to 1 hp and start hurling Ultra Balls, but I can never nab it! I need Thunder Wave...good thing my Jolteon learns it at lvl 42, it's lvl 40. That's funny because that made me remember the time my friend caught Moltres with a pokeball. Me and him were dying of laughter cause i spent about 30 minutes trying to catch and he caught it in one minute. I helped though cause I weakened it for him. i got red first, but i dont play it anymore. you can only hold 20 items which makes me angry. ekoj a saw ti yad b ym ton si tghie pes. I don't see the point. Being an avid Midnightian, there is a complete lack of moves. Poison, best move - Acid. Ghost, best move (that gains STAT) - Lick. Dragon - Dragon Rage. I can't take advantage of Draggy's high Special!! So, no, I never play them anymore. The only time I play it now is for the good old joy of glitch city. Besides, I'm busy cloning my lugia in emrald to unleash on the internet! 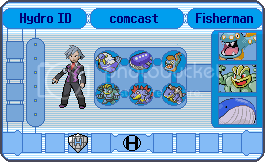 I am replaying Blue right now, with the final goal of dusting off Pokemon Stadium, eventually. I gotta figure out which friend I lent my N64 controllers to . . . Anyway, I'm currently training a Charmeleon, Pikachu, and Kadabra, with the goal of adding Snorlax, Lapras, and Mew. Playing this game brings back so many memories of lazy summer afternoons on the bench swing of my neighbor's house with every kid in the neighborhood watching me play Red over my shoulder. I have no idea what happened to that Red version . . .